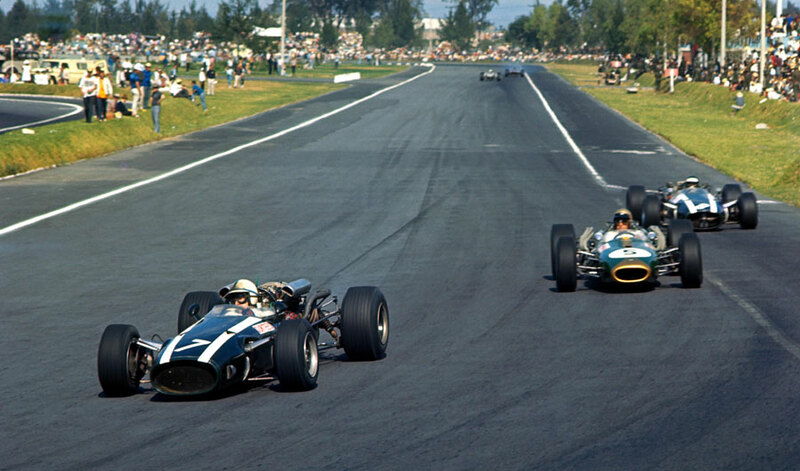 John Surtees finished a remarkable yo-yo season with victory at the Mexican Grand Prix. He started 1966 as a Ferrari driver but walked out on the team immediately after victory at the Belgian Grand Prix following a row with the team manger; thereafter he raced for Cooper-Maserati and secured the win in Mexico City for them, but even as he did he was poised to join Honda for the 1967 campaign. The grid had a slightly unfamiliar look as Ferrari, with nothing at stake, decided to stay in Europe, although the official reason was the team's workshop was being rebuilt for the 1967 campaign. Richie Ginther took the lead off the line but on the second lap Jack Brabham, from the second row of the grid, overtook and held onto the lead for six laps until Surtees passed. Ginther looked as if he might challenge in his Honda for a time before he had to drop back with mechanical troubles, and although Brabham rallied near the end, Surtees was too far clear, the pair finishing a lap ahead of the field. Jim Clark's challenge ended when his Lotus' reliability again let him down, the gearbox failing after nine laps. The BRMs of Jackie Stewart and Graham Hill broke down for the second successive race - by the start of the next season Hill had become Clark's team-mate at Lotus. Local hero Pedro Rodriguez moved third when Jochen Rindt was forced to retire but hopes of a podium ended 17 laps later when his Lotus suffered transmission failure. The perennial problems of stray dogs caused one accident when, in practice, Innes Ireland was unable to swerve in time and hit one, damaging his BRM and destroying the animal. In the race itself, Ronnie Bucknum had a lucky escape when he smelt smoke as he headed down the straight and, looking down, saw his seat was on fire. He managed to stop and leap out, and after the flames were put out it emerged the blaze was as a result of an electrical fault. Amazingly, he was able to get to the pits where his Honda was patched up and he went on to be the last of the eight finishers. Goodyear had flown out tyres ahead of the practice session and they were found to be a second a lap quicker than the Dunlops and several teams changed for the race - four of the first five finishers were on Goodyears.